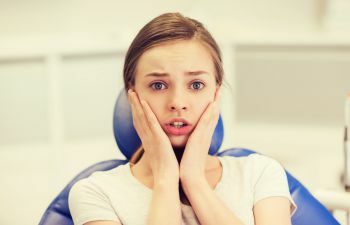 Dental anxiety or dental fear is a very real condition, one that affects both adults and children. When it comes to your child, it is especially important to find ways to reduce this anxiety so that any negative feelings towards the dentist doesn’t carry over into adulthood. Finding a dentist who is equipped to treat pediatric dental anxiety is your first step. At Georgia Orthodontics & Children’s Dentistry, we understand the distinct fears and anxieties that kids face when visiting the dentist. Our office provides kid-friendly amenities, a compassionate staff and even nitrous oxide to help your child feel more comfortable. Educating your child on what to expect can be very helpful in easing their fears. This may include telling them what the dentist will do and how long it may last. Make sure you use kid-friendly language and avoid negative terms. A proven technique to helping your child get through any intimidating situation is to simply distract them. While you are in the car on the way to the dental office or waiting in the lobby, try to shift their focus by playing a game, bringing an iPad or starting a conversation about a recent fun event. Providing positive reinforcement for brave behavior can also work for some children, especially those with mild anxiety. Simple stickers, baseball cards or other tangible (non-candy) prizes are a great idea. Helping your child physically relax can provide significant improvement to their anxious state. This can be as simple as deep breathing exercises, or it may involve nitrous oxide from your dentist. Nitrous Oxide is the most commonly used form of sedation dentistry, and one that is very safe for children. By breathing in a colorless, sweet-smelling gas through a nosepiece, your child can fully relax during their procedure. They are still aware of what is going on around them and even able to communicate with others. Nitrous oxide wears off within minutes after the nosepiece is removed. At Georgia Orthodontics & Children’s Dentistry, we proudly offer a full menu of tactics to help your child feel relaxed and comfortable while they are here, from encouraging parental involvement to providing sedation dentistry. We believe that every child, regardless of their level of anxiety, deserves to have a rewarding and stress-free experience at the dentist.